What do Australian charities’ tax exemptions, #Twitdef and Wikileaks all have in common? Give me a moment. Last week the High Court held that Aid/Watch is a charitable organisation for the purposes of tax assessment. This would be unremarkable, but Aid/Watch is an organisation that campaigns for effective foreign aid policies through the generation of public debate, and critique of government policies and actions, that is, it has a ‘political’ advocacy role. Advocacy organizations could not traditionally gain tax exemptions as charities, if they are ‘political’. Aid/Watch’s endorsement as a charitable institution had been revoked in October 2006, after the Tax Office had characterised the main activity as ‘political’ and thus not within the ‘beneficial purposes’ limb of the definition of ‘charitable’ trusts, expressed in some old UK cases, Pemsel and Bowman, and in Australia by Justice Dixon in the North Shore Hospital case (1938) (explained in more detail by the LampPost). The majority of the High Court referred to now well-established authorities such as Lange’s case (1997) establishing that free communication on matters of government and politics is an indispensable part of the system of representative and responsible government established by the Constitution, particularly by s 7 and s 24. Those sections require that parliament be ‘chosen by the people’. So whilst the Aid/Watch case initially might seem to be about tax and charities law, underneath, there runs the theme of the importance of free communication on political matters. Likewise, some see that underlying the recent threat by Chris Mitchell of the Australian to sue Julie Posetti of the University of Canberra for defamation (aka ‘#twitdef’; see Professor Sarah Joseph’s summary here, and update here) there lurks the same constitutional issue: the scope of the implied right of political communication and the discussion of public affairs. A number of people have asked me to explain what that is, so here we go. The context: The Commonwealth Constitution contains few expressed guarantees of individual freedom against government action. It was drafted at a time when faith in the doctrine of parliamentary sovereignty and the democratic processes inherent in a parliamentary system with ministerial responsibility was strong; so constitutional guarantees of an individual’s civil and political rights was not deemed necessary. Some implied limits on Government power have been found by the High Court over the course of 100 years of case law, but not many. In the 1990s some fundamental rights or guarantees were identified in the Australian Constitution, where the Court recognised that certain immunities from government action are derived from the text of the Constitution itself. Although some criticise this process of judges “finding” rights by implication, implications have always been a valid aspect of constitutional interpretation, seen long ago in the development of the doctrine of separation of judicial power, and of the intergovernmental immunities doctrines. The source: The implied freedom of political communication was first explained by the High Court in Australian Capital Television v Commonwealth (ACTV case) (1992) and Nationwide News v Wills (1992). In those cases the court said a guarantee of freedom of expression in relation to public and political affairs must necessarily be implied from the provisions which the Constitution makes for a system of representative government; s 7 and s 24 of the Constitution each guarantee that Parliament be ‘chosen by the people’. Such a freedom is an essential element of representative government, it is necessarily implied in the prescription of that system within s 7 and s 24, amongst others. The defences: Now how that relates to defamation law is a bit tricky (and I am no expert here) but I will summarise it this way; defamation is a civil cause of action that allows a person whose reputation has been harmed by reason of publication of materials (by words, or otherwise) to sue those responsible for the publication (UTS have a clear summary paper). The statutory laws of defamation were reformed in 2005, and are largely uniform across Australia. The statutory regime does not oust the common law but the laws are adjusted somewhat by the common law. An example of where the common law is still relevant includes the High Court’s expression of the Implied freedom of political communication. Defamation law recognises a number of circumstances in which the public interest in the material being published outweighs the potential damage to a person’s reputation. In fact as Professor Pearson says, (referring to broadcast news) ‘the bulk of that defamatory material is — or should be — defensible.’ So there are a series of ‘defences’ to defamation actions. The implied freedom of political communication is one aspect of ‘qualified privilege’, which is a defence to a claim of defamation. The freedom of political communication is not really a guarantee of a personal or individual right, because s 7 and s 24 confer no rights on individuals. The freedom applies to laws (including censorship, defamation or charity laws) that may interfere with certain kinds of communication. The test: In Lange’s case, the Court set out a two stage test for the validity of laws thought to interfere with the freedom; the first stage is to examine whether the law burdens freedom of communication about government or political matters either in its terms, operation or effect. If it does so, the second step is to whether the law is ‘reasonably appropriate and adapted to serve a legitimate end in a way that is compatible with the maintenance of the constitutionally prescribed system of representative and responsible government’. The second part of the test allows governments to ‘reasonably’ regulate political speech. But the cases show that attempts to prohibit political speech outright will fail this test. So, for instance, whilst there are limitations on publication of certain information, the Australian governments could not (and have not) successfully ban publication or transmission of all the Wikileaks cables on Australia that are due to be released in the new year being released now (and to do so would be pointless, in any case). In the Aid/Watch case the Court referred back to Lange’s case and said “Communication between electors and legislators and the officers of the executive, and between electors themselves, on matters of government and politics is “an indispensable incident” of that constitutional system”. So while not all communication of public affairs, or matters in the ‘public interest’ will be protected, discussion of policies on poverty alleviation, foreign affairs or climate change science could readily be ‘political’ discussion. Equally, critique of the performance of members of the local council, the police force, or the judiciary can be protected speech. These will only be protected political discussion if the critique is ‘reasonable’ and not made dishonestly or with malice. Insults are as much a part of communications concerning political and government matters as is irony, humour or acerbic criticism. Many of the most biting and offensive political insults are as witty as they are insulting. The conclusion: In Australia we do not have ‘free speech’ protection of the kind we see in the United States and elsewhere. The protection of political communication is a small, but important subset of a broader concept of free speech. The High Court has not finished its exploration of how and where the implied freedom of political communication arises. In 2007 it decided Roach’s case, on voting rights for prisoners. This year it has considered the concept of political communication in the Aid/Watch case, and a voters rights case (Rowe v Electoral Commissioner). I have no doubt there is more to follow. Melissa Castan, Deputy Director, Castan Centre for Human Rights Law, Law Faculty, Monash University, National Convenor, Alternative Law Journal. You can follow me on Twitter. Previous Post Previous post: Developments in Twitter Defamation case. I visit every day some web pages and sites to read posts, except this weblog offers feature based content. the Freedom of Political Communication | Castan Centre for Human Rights Law”. This is the 4th blog, of your site I actually read through. 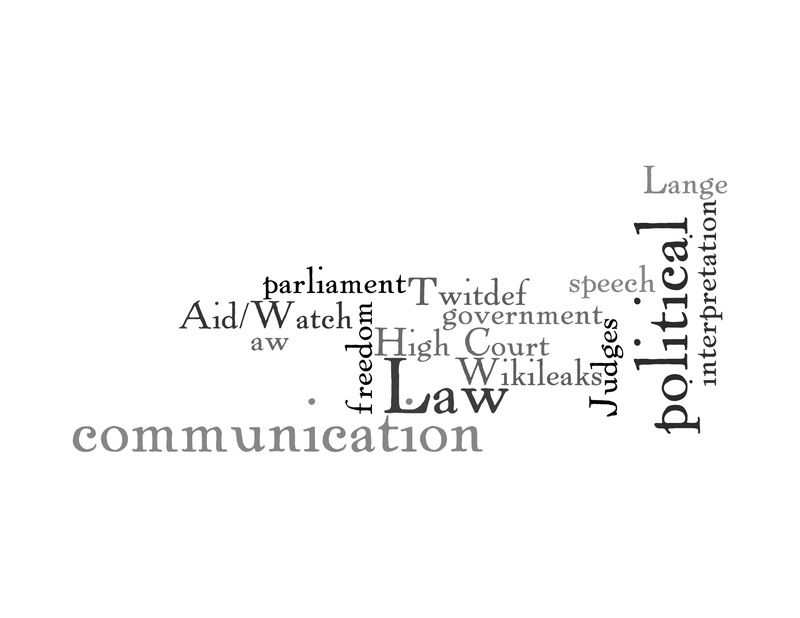 the Freedom of Political Communication | Castan Centre for Human Rights Law” the best.